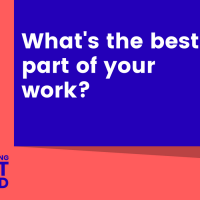 Marketing Out Loud: Episode 118 - What's the best part of your work? I was chatting with Rob Deptford yesterday and he asked me this question. Just before my conversation with Rob, I received an email from a client who is on the last leg of my coaching program. This is coming from a McKinsey trained leadership consultant who has TAUGHT more training programs that most people have attended. To hear that from her was definitely humbling… but also INCREDIBLY rewarding. That’s my favourite part of my work. What keeps you going day in and day out?